Rolawn is the UK’s leading turf grower and supplier of Britain’s Finest Turf. We are also renowned for our market leading high quality topsoils and barks. We pride ourselves on our professionalism, reliability and integrity, which, allied to our culture of innovation and constant improvement, has resulted in the Rolawn brand becoming the industry benchmark of quality and service. As market leaders, we are also well known for keeping a sharp focus on the future trends and issues that will affect the industry. Rolawn has been growing turf for over 40 years and entered the topsoil market in 2001. In August 2017 we were very proud to achieve two significant milestones, delivering our 160 millionth roll of turf and also sold our one millionth tonne bag of topsoil. 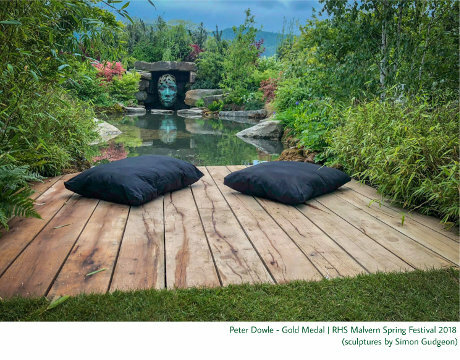 Our turf, topsoil and mulch products have been incorporated into numerous medal winning gardens at RHS horticultural shows. This has been achieved through our focus on high product quality and service. We were delighted to be an official supporter of the RHS Malvern Spring Festival 2018 and the suppliers of choice for the BBC Gardeners' World Live Show gardens for growing media, mulches and turf. Rolawn has gained certification under the independently audited quality and environmental management standards BS EN ISO 9001:2015 and BS EN ISO 14001:2015. Whether you choose to purchase direct or via our extensive nationwide stockist network, Rolawn has the most highly developed distribution organisation within its market. Using established haulage partnership agreements with both bulk and pallet carrier networks we can ensure convenient year round availability. Rolawn values the importance of having the highest calibre people. By combining close management and co-ordination of all departments, customers not only receive the best quality products, but also the highest levels of customer service. As Europe’s largest producer of cultivated turf and Britain’s leading supplier of high quality topsoil Rolawn recognises that reducing its environmental impact is an integral and fundamental part of its business strategy and operating method. Consequently, we continually review our production procedures and business practices. In recognition of this fact we have been awarded a Green Achiever Gold award, which endorses the positive steps taken to develop our green credentials. Rolawn is certified to BS EN ISO 14001:2015 for its Environmental Management System. Rolawn is a member of the British Association of Landscape Industries (BALI) and also has a close working relationship with the Sports Turf Research Institute (STRI), the world's leading sports turf consultancy and independent authority in turfgrass research agronomy. In 2005 Rolawn's Chairman, Ken Dawson, was awarded the Distinguished Honorary Member Award by Turfgrass Producers International (TPI) in recognition of his contribution to the turf grass industry. The TPI is a global organisation committed to the advancement of the turf grass industry and is recognised throughout the world as the most respected and prestigious body of its kind.